Cranbeary entering her temporary den at the Alaska Zoo. Video by John Gomes. 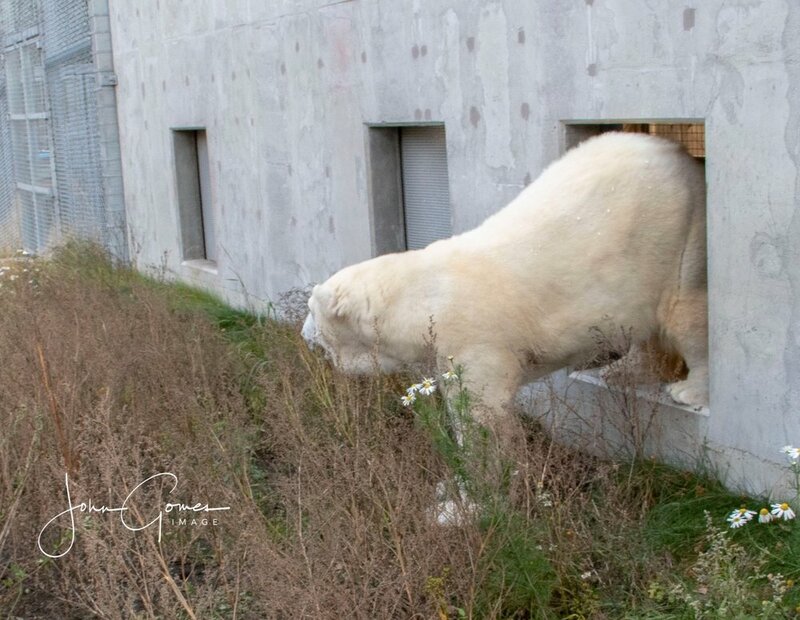 We are beyond pleased to welcome the Alaska Zoo’s newest resident, Cranbeary the polar bear! She arrived with her keepers in good health on Wednesday morning, after making the journey from the Denver Zoo. Cranbeary immediately began exploring the tall vegetation in the behind-the-scenes polar bear yard. She is doing well and appears to be taking in the sights, sounds and smells of her first day in Alaska. She is energetic and curious about zoo staff, spending most of her time breathing in the fresh, Alaska air and moving around on a bear mission to explore every inch of her surroundings. You will notice some toys Cranbeary has in the video which were packed for her new Alaska Zoo home by Denver Zoo keepers. Here are some of the first images captured by zoo photographer John Gomes as Cranbeary first stepped “paw” on Alaskan soil. Very special moments to capture! Whoa, where am I? Cranbeary’s first glimpse outside of the den building. Taking in the smells of Alaska and the Alaska Zoo, a perfect home for this Arctic species. A long journey complete from the Denver Zoo to her new home at the Alaska Zoo. The perfect time to stop and smell…and taste…the flowers!